I'm an administrator IT and also repair desktop computers & servers for many years. According to Hp QuickSpecs for this particular ProLiant server, E7-4800 series are only supported in DL580 G7 CTO (643086-B2x) & Preconfigured models (6430xx-xx1/6967xx-xx1). From what I know, the main difference with a entry-level are E7 cartridges. Motherboard, CPU board and I/O board are the same part numbers. To resume, it seems that server doesn't post when socket PROC3 is mounted with a E7-4870 (test all four 4870 on it, same result). I suspect a electrical/power issue on this socket because TDP is higher than E7530. I plan to replace CPU board first, any advices are welcome. Do any of you have already met such a problem ? We have just upgraded three DL580 G7's that are model 584084-001 to Xeon E7-4870 processors. We found that what mattered in our environment was the revision of the main system board (not the CPU board/tray or SPI riser). After reading that last response, I checked iLO to verify all of our PAL versions. We do have one server that is running 4 E7-4870 processors with 1TB of memory on a CPU board with PAL version 0x10. We found that as long as the system MainIO board (hp part 512843-001) is revision 0B or later, it works. Two of the three servers had revision 0A of the MainIO board and they would not post with the new processors. On those systems, all we replaced was the mainboard and the result was a working server. Everything just worked on the server with the newer MainIO board revision, so we initially tried moving its CPU/Memory tray to the servers that were not working. When they still failed to work we decided that the issue lied outside of the CPU/Memory tray. The revision on the MainIO board was the only difference between the non-working servers and the working one. We ordered the mainboards from our usual supplier, but had no way to specify revision. We just ordered and then verified the revision before installing. This is a "call HP support" situation. Regardless of your warranty status, you're trying to make something work that requires specialized knowledge. I'll assume you've upgraded all of the firmware, but it also seems like you've recognized, but ignored a serious compatibility issue. Like ewwhite notified it, I just ignored a serious compatibility issue. I finally got my hands on a 643086-B21 CTO model, fitted with two E7-8837 on PROC1 & PROC2. As you can see, everything works fine (4xE7-4870 & 4xE7530 cpus). Comparing to 584057-421 model, hardware, p/n boards are exactly the same. So where is the difference ? In this kind of server, each board (SPI, MainIO, CPU) have is own chip ROM (Lattice EEPROM/Flash), named CPLD for Complex Programmable Logic Device and PAL for Programmable Array Logic. It can explain why some Hp ProLiant servers take so much time to boot. 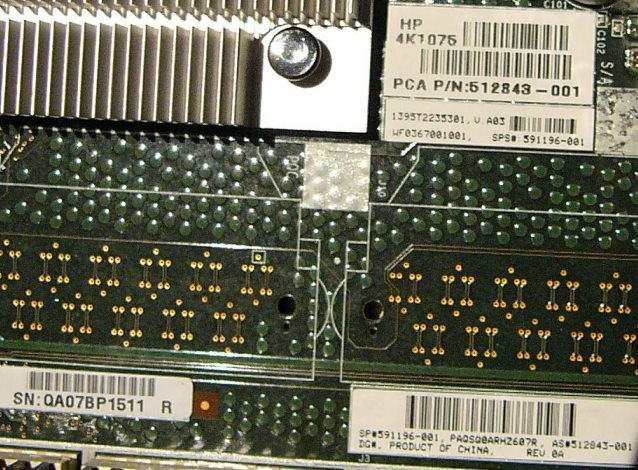 Note: 4xE7-4870 with CPU Board PAL v0x10 won't boot on a DL580 G7 p/n 584087-421. So replace/update CPU Board is not sufficient, you have to replace/update MainIO/SPI boards too (not separatly tested). As has been said before, E7-4800 series are only supported in DL580 G7 CTO (643086-B2x) & Preconfigured models (6430xx-xx1/6967xx-xx1). But if you get failed board, especially for second market, you have to replace it with the right part number and take care to get the right compatible CPLD chip version ! - A Expansion board can't be added as you have to populate PROC3. You have main IO board 591196-001 rev 0A. That's the board with the PCI slots. The label over near the connectors to the CPU board says rev 0A. You need rev 0B. The server will not post and boot if you have an E7 processor in slot 3 and the rev 0A main board installed. As soon as you remove processor 3 or install a rev 0B board, everything will work. Not the answer you're looking for? Browse other questions tagged hardware hp hp-proliant central-processing-unit or ask your own question. Compaq ProLiant DL580 boot menu? How do I upgrade my HP ProLiant ML150 G6 server RAM? 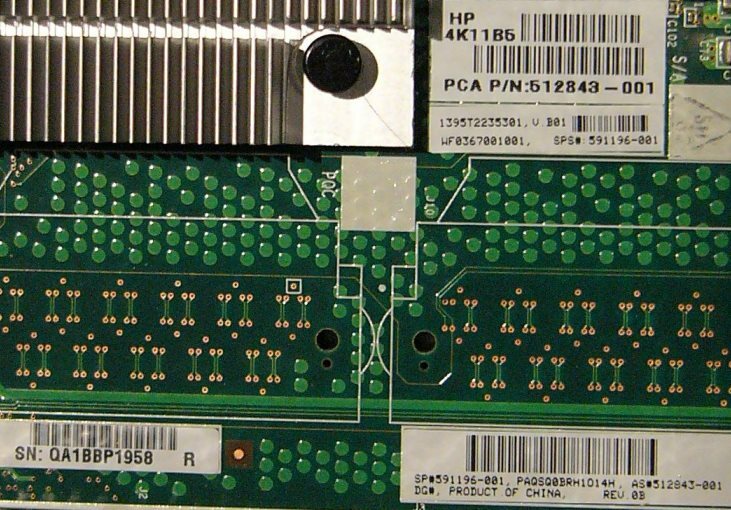 HP ProLiant DL360p Gen8 how to choose correct heatsink? How to activate NUMA in HP Proliant DL580 G5 Server?